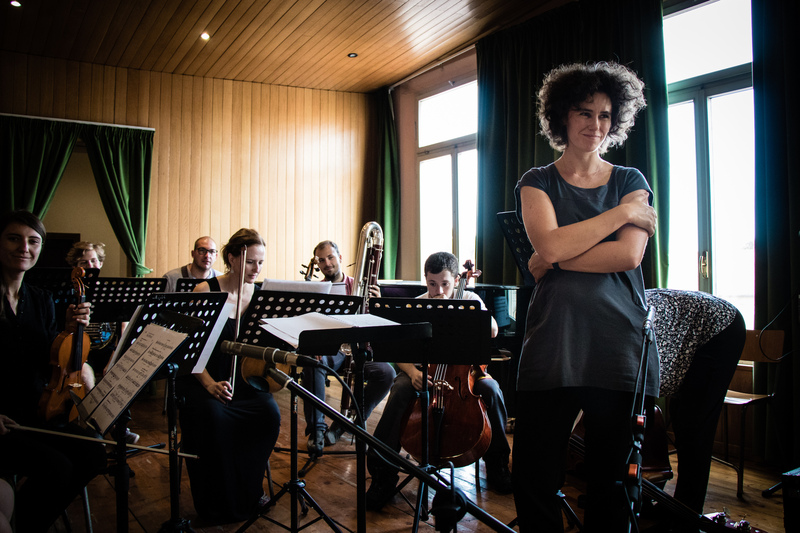 The composition program at soundSCAPE seeks to offer significant artistic and professional learning opportunities for composers, through participation in intensive composition seminars, lectures, rehearsals, and premieres of their works. Central to the program is the daily composition seminar, a forum for all composition participants to present their work for general discussion and technical scrutiny. The purpose of the seminar is to elucidate the connection between artistic expression and compositional technique in the works being presented. The seminar will be led by composition faculty and guests. Each member of the composition faculty will offer a presentation about his/her own work. In addition, the faculty will offer analytical presentations about works selected from the festival’s performance repertoire, as well as other significant works from the past 50 years. Performance faculty offer a variety of presentations as well, ranging from workshops on performing complex rhythms, to writing for voice and other instruments. Faculty members Luca Cori, Marcela Pavia, and guests will offer individual lessons to interested participants. Each participant can sign up for two individual meetings with faculty during the course of the festival. Special guest George Lewis will be in residence for the complete festival, and will be meeting with composers in master classes and other daily events. Each participant in the composition program will be commissioned to compose a work for premiere at the festival. soundSCAPE offers a wealth of performance resources, ranging from solo and small chamber formations to a pierrot-plus ensemble, including resident string quartet, FLUX. Commission assignments are determined by the program coordinator, upon consideration of the previous experience of each participant composer. Performances are meticulously prepared under the supervision of performance faculty, or of a member of FLUX quartet. Participant composers are expected to rehearsals of their work, and strongly encouraged to attend the rehearsals of works of their peers, and of other repertory being presented at the festival. Each participant will receive a recording and video of the performance of their work. In addition to filling out the online application, composers must submit one work of any instrumentation for evaluation, accompanied by a MIDI/mp3 recording. Accepted composer applicants will be notified of the details on their commission by February 15, 2019. An electro-acoustic element may be arranged for commissions, if desired. The deadline for receipt of the finished score will be announce for early in the month of May. Contact us – we’re happy to help!